Finished bust (not overlapped): 32.25 (35.5, 38.5, 41, 44.25, 47.5, 50.5, 53.75, 57, 60.25, 63.5)". Model is size 34" bust wearing a 35.5" size with a 3" overlap at neck. Rhonwen is a welsh name that means fair, slender. It is an unusual traditional name that is classically feminine yet strong. It describes this cardigan perfectly. Cables represent strength, these cables with their unusual shape mixed with lace have a feminine air. 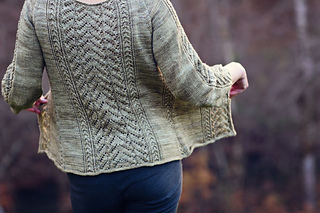 The shape of the cables on this loose fitting flowing cardigan reminds me of willow branches—fair and slender. This cardigan is designed with positive ease, loose sleeves and an adjustable neckline. 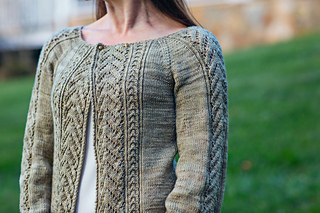 The neck can be finished so that the fronts overlap or gathered so the the fronts meet. The loose sleeves can be made more fitted by adding decreases. The length of the body and sleeves are easily adjusted. 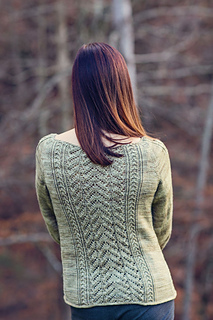 I’m really enjoying knitting this cardigan the pattern is easy to memorize and fun. I’ve found the pattern easy also-it’s very easy to “read” my knitting. It’s become relaxing and I like seeing it grow. I love the pattern have it mostly memorized! I saw beautiful Rhonwen…in work! jstdt3t had good notes on sleeve and neck modifications here. Finished bust (not overlapped): 32.25 (35.5, 38.5, 41, 44.25, 47.5, 50.5, 53.75, 57, 60.25, 63.5)“. Model is size 34” bust wearing a 35.5” size with a 3” overlap at neck. Yarn: Anzula Cricket, 80% merino wool, 10% nylon, 10% cashmere; 229m (250 yds) per 114g skein; color: Clay, 4 (5, 5, 6, 6, 7, 8, 8, 9, 10, 10) skeins, 1000 (1141, 1250, 1382, 1500, 1623, 1824, 1933, 2083, 2280, 2396) yds. Other: Stitch markers, stitch holders or waste yarn, cable needle, size G crochet hook, tapestry needle. Two size 9mm buttons. Gauge: 20 sts and 26 rows = 4” in Stockinette Stitch. 21-st Sleeve Lace Panel = 3.25” wide, 55-st Back Lace Panel = 9” wide, 31-st Front Lace Panel = 4.5” wide, when blocked. 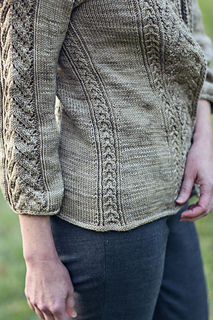 This sweater is a compound raglan constructed from the top down in one piece. The compound raglan allows for a more flattering fit because the rate of increase varies to more accurately follow the shape of the body. It increases more rapidly between the neck and shoulders and at the end to curve around the underarm, but more gradually in the section in between. 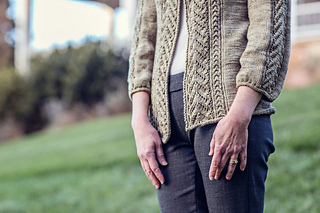 The cardigan is designed for the fronts to overlap. How much it is overlapped is adjustable. 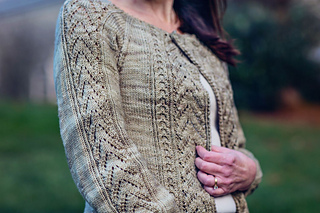 The yarn overs in the lace design are used as buttonholes but if a deeper overlap is desired, loops can be added to each front top corner instead. The body increases at the hip are worked every 6th row on the front sides. If you want more room in the hip area, you may work them more often or work them on the back side also, but be sure to allow for more yarn. The sleeves are designed to be full and gather at the cuff. There are two extra stitches pick up at the under arm. 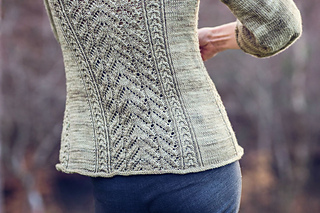 If a tighter sleeve is desired the extra stitches may be left out and decrease can be added. 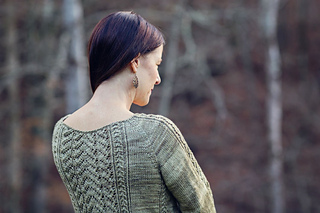 And of course the sleeves and body can be easily lengthened by adding more rows.